As it’s revealed that more Brits work to live than live to work, Citipeak Events investigate the reasons why there is a lack of passion in the workplace and advise companies how to get this desire back. Researchers found that 72% of Brits state that they work to live and are less passionate about working for a good career and wanting to build on knowledge and skills. In a recent survey conducted by Paymentsense, researchers found that 72% of Brits state that they work to live and are less passionate about working for a good career and wanting to build on knowledge and skills. On top of that, one in three workers is unhappy in their current role, with 25% of people considering a complete change in career in 2018. With only 21% of people still feeling the hunger for their careers and living to work, it has come to light from the survey that 19% of Brits face very little or no progression opportunities. With the peek in people’s careers being around the age of 42, many individuals start to lose passion for their jobs beyond that age; only 11% of people in their 40s report being passionate about their job, with just 14% still wanting to build on their career. Increasing numbers of Brits are choosing money over passion when it comes to working and businesses are starting to feel the effects. The result of people settling for working to cover living costs is a lack of motivation in the workplace and a higher number of disengaged workers; both of which will have a detrimental effect on the operations of a business and the retention of top talent. Sales and marketing firm, Citipeak Events warn companies that they need to look out for the early signs of disengagement and ensure that strategies are in place to maintain high levels of motivation and passion. For a long time, the London-based firm has implemented strategies to ensure motivation and passion are kept high; the approaches include offering advice and guidance through workshops and mentoring, incentives and rewards for hard work, plus making individuals feel valued and included in decision-making processes. This is all in addition to lots of opportunities for individual learning and business development. Citipeak Events is an outsourced sales and marketing firm that adds the personalised touch to the customer buying experience. Citipeak Events is an ambitious firm and believe that the individuals they work with should have the necessary skills to be the best person they can be. 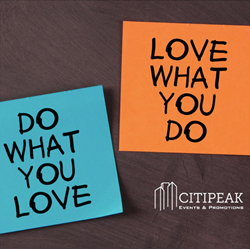 Therefore, the professionals that Citipeak Events work with have developed professionally in every area of sales, marketing, leadership, presenting and management which has instilled confidence in their work ethic and maintained high levels of passion.